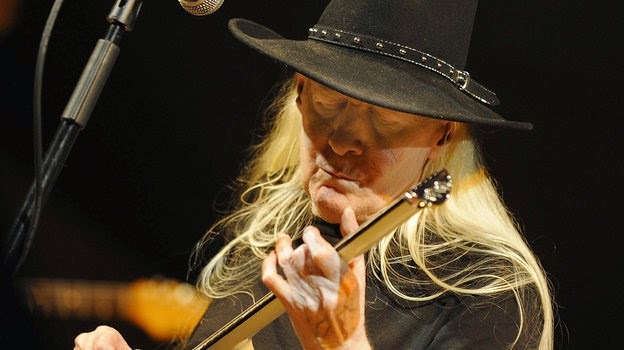 Texas blues legend Johnny Winter has died, ending a long and expansive career that included working alongside bluesman Muddy Waters and playing at the Woodstock festival. Winter, who was 70, had been set to release a new album this fall. Winter's death was confirmed by his publicist, who issued a statement saying, "His wife, family and bandmates are all saddened by the loss of one of the world's finest guitarists." Winter reportedly died in his hotel room in Zurich, Switzerland. A cause of death has not been provided. He had maintained a busy touring schedule, with dates in the U.S., Canada, South America and Europe scheduled for a four-month tour that was to begin this month. As a guitarist, Winter was adept at both finger-picking blues grooves and rock-star pyrotechnics, building on the talents that had marked both him and his younger brother Edgar as musicians early in their lives — they formed their first band when Johnny was 15. Both brothers were born with albinism, and as adults, they grew their white hair long, making them a striking presence on stage. Winter emerged on the national scene in 1968 after being featured in a Rolling Stonearticle. That same year, he released his first album, The Progressive Blues Experiment. One year later, he released his self-titled album, and then a follow-up called Second Winter. The songs on those albums were a mix of originals and standards — but they were all defined by the liquid speed Winter was able to pour out of his guitar.